Le Café - Also a great place for a beer! You know you're getting old when you start making, or at least thinking, “when I was young, we used to ____” statements. While being the singer and guitarist in a heavy, primal sounding rock duo keeps the old feelings at bay, I must admit that these types of statements are becoming more common for me. For example, when I was young we used to make our own coffee. Yup, it's true, we used to make it ourselves. I started drinking coffee in second year university when I had a co-op job at the Ministry of the Environment and our department had a regular, household coffee maker situated on the wall outside my open concept cubicle. The payment system consisted of putting down a tally mark when you took a cup. The coffee making protocol dictated that if you finished the pot you made another. Way back then we even made (and still do make) our coffee at home. No cartridges were used and the percolator did not look like R2D2. Now it's an everyday occurrence to instead see a 20 car traffic jam outside the Tim Hortons before work. At the risk of sounding unpatriotic (and it is currently hard to be patriotic when being led by the Harper government), I ask the question: is a “Timmie’s coffee really that good that you feel the need to rush and wait in line to get one? And for those that feel the need to answer this question, please don't, as it is rhetorical. I certainly don't want to get up early just to line up to buy a product that I can better make at home at a much lower cost. And I don't think coffee makers are pertinent anymore in government departments or companies –coffee making has been taken over by commercial corporate interests. The days of gossiping around the floor coffee pots are long gone. I have some good coffee memories from when I did my PhD in Québec. In the mornings, we made super-strong coffee in the lab coffee pot and our supervisor could sometimes hear us laughing over our morning brew as he came up in the elevator, despite it being located at the far side of the hall. I remember my next-door neighbor enjoying a tiny cup of espresso while leisurely standing in his front yard doing nothing but soaking in the sights and sounds of the neighbourhood. When I did go out for coffee the atmosphere was much different than here. At one local café it would take about 20 minutes for your cappuccino to be made and when the owner brought to you he would serve it with pride, as if it were a great masterpiece. And it was. I made the mistake one day of asking him for a decaf and was sternly lectured on the merits of “real coffee”. That was the first and last time that I made that mistake. Coffee at his shop was an experience and not just a robotic routine. With these thoughts in mind, I humbly present to you “Le Café”. I constructed it in my backyard between nectarine and peach trees that I planted with my kids a couple summers ago. The bricks were picked up free from the side of the road following a tip from a friend who saw them and knew that I like to scavenge and reuse building materials. They only took about an hour to lay. While they are not entirely level, I think that only adds to their old world charm. 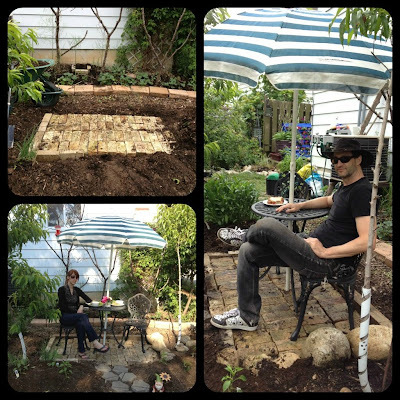 The soil I dug while laying the bricks became the raised beds that encircle Le Café. The beds are planted with Shasta daisies, Echinacea, sage, and chives. I also added some night scented tobacco, as I thought that their evening perfume would add to the atmosphere while enjoying a glass of wine on the café on a moonlit night (and that maybe I could use their nicotine containing leaves in an organic bug spray...). And that brings me to the aspect of design that was the driving force behind building the café. It wasn't so much about typical landscaping elements such as plants or colors, or even standard Permaculture design concepts such of us multiple functions, or stacking of elements. Instead it was based on how I wanted to feel - I wanted to create an experience, a place to slowly drink my home brewed coffee and just enjoy the beauty of the gardens around me. Designing in this manner is perhaps best conducted by asking yourself a couple of questions: What kind of life do I want to live? What do I want to see myself doing? Waiting by myself idling in a car to go through a coffee shop drive-through is not one of my answers to these questions. Judging by the typical expressions on the faces of the people in said lines I can’t see that is high on their list either, they just have never really thought about it. In contrast, let me share today's morning coffee experience with you. I am sitting in the café writing this entry and so far have been visited by a robin that sat on the top of the Mulberry tree, a cat that was peaking out from underneath said tree, albeit not at the same time as the robin, in the play area that my daughter has constructed that we refer to as “the restaurant”, a squirrel that was climbing over the clay oven’s woodpile, as well as several chickadees, sparrows, cardinals, and goldfinches that have flown over in their morning travels. The kitchen window behind me also opened up and I was treated to a sweet good morning hello from my daughter. Now this is how you have your morning coffee! Permaculture is about designing a sustainable lifestyles and I will argue that my manner of having morning coffee is more in line with this than the typical morning madness. Please feel free to share how you are designing the experiences that you want to have into your permaculture and life plans! Sun Tea, Solar Brew, Sol Highball, Photon ____ ?